In a bizarre marketing twist for a game already riddled with bizarre marketing decisions, SEGA has collaborated with another YouTube personality to promote Team Sonic Racing. This time, they took a YouTuber best known for Minecraft out to SEGA Europe’s office to drive a sports car. Don’t worry, it’s relevant – Sonic was also inside. Last year’s explosive release of Sonic Mania wasn’t just about a game that ended up thrilling both new and old blue blur fans. It was also proof that a brand new, ‘classic’ style 2D Sonic title will sell – and sell it most certainly did, cementing itself in the annals of hedgehog history. 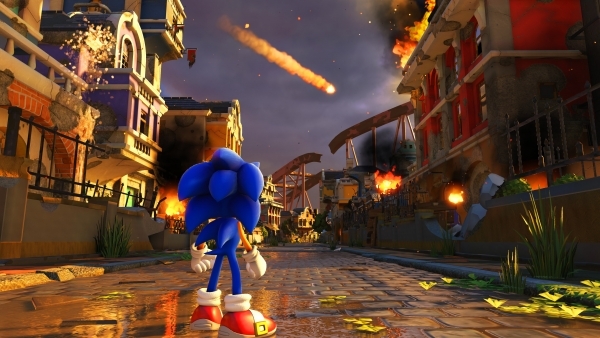 But, while widely regarded as one of the most critically-acclaimed Sonic titles in recent memory, there were some clear presentation omissions and missing elements in the base game – elements that you would think Christian Whitehead and co would have included, if they were just given more time to bake it in. Sonic Mania Plus Leaked On PS4! Out of respect for the developers, we will not be posting major details regarding the spoilers that have been discovered from this leak. Following reports on our forums, it would appear that Sonic Mania Plus got accidentally leaked onto the Playstation Network just over an hour ago. It seems that someone accidentally put an update file onto the public side of the network and if you were using your PS4 at the time, had Mania installed on your system and had automatic updates turned on, the console downloaded what appears to be a new ‘test build’ of the game which includes a large portion of the Mania Plus update. We’re going to keep the big spoilers out of this update, but reports indicate that there have been significant changes; such as the level design as well as some new transitions between the levels. Other changes noted are quite major and from last time a lot of you requested that we don’t include spoilers unless they are very clearly marked… So if you are curious to see them, check out the topic on our forums, the spoilers start instantly when you click the link, so this is your last chance to turn back. Well this is a surprise! You might remember how Sega released a classics collection many years ago on the PS3 and Xbox 360? Well it looks like they’re doing it again. Depending on your region, Sega Mega Drive Classics or Sega Genesis Classics is a collection of 50 16bit era titles which will be making their way to current gen systems, according to the Sega Europe community manager, they are as follows. A bunch of enhancements and extra features have also been promised, including online and local multiplayer mode. Rewind mode, a 3D room user interface, various themed boarders for playing in their original resolution and horizontal flip mode. Sega Mega Drive Classics launches on May 29th on PC, PS4 and Xbox One. With less than a month to go until the official release date of Sonic Forces, PSN Profiles has listed all 46 trophies that can be achieved in the PS4 version of the game. Be warned: some spoilers ahead! Looks like the rumors are true! Sega has announced on the Sonic the Hedgehog Twitter account that Sonic Forces will be arriving on November 7th along with a US price tag of $39.99. On top of that, folks who pre-order the game will receive a controller skin for their system of choice. Along with the controller skin comes five different skins for the avatar based on several Sega/Atlus game properties including Jet Set Radio, Persona, Puyo-Puyo, Super Monkey Ball and NiGHTS. Looks like a great price and bonus for those interested in the upcoming game. Sonic Forces will be available for Switch, PS4, X-Box One and PC November 7th. So Sonic Mania is out and available to download on home consoles. On PlayStation 4 and Xbox One, there are a range of Achievements and Trophies to collect and challenge yourself with. If you’re having trouble getting some of them, why not look through our Game Guide for some pointers? Note: This review qualifies as ‘spoiler free’, but it does contain information on stages, gameplay elements and story concepts that have already been made public by official SEGA marketing channels. Be aware, if you’ve been on a total media blackout. SONIC MANIA WEEK: Your One-Stop Shop for Mania News and Info! Welcome to ‘Mania Week’ on The Sonic Stadium! To celebrate the upcoming release of the SEGA/Whitehead/HeadCannon/PagodaWest collaboration project, we will be spending the next week producing a whole heap of awesome content – all about the Mania! This post will house links to all of the stuff we have planned, in one easy location, so keep this page bookmarked and come back often! Continue reading SONIC MANIA WEEK: Your One-Stop Shop for Mania News and Info! Sonic Mania is right around the corner, and you’ve probably pre-ordered the digital version a hundred times over (definitely not an exaggeration), right? What’s that? Something missing? You wish you had the money to grab yourself a Sonic Mania Collector’s Edition on PS4, or that you had the chance to get it before it sold out? Well, boy are you in luck – because we have five of these bad boys to give away courtesy of SEGA Europe. At the front of Sega’s booth at E3, there were two different lines; one queue was for Sonic Mania, while the other, about half the length, was Sonic Forces. The crowds definitely seemed more excited for one over the other. Have Sonic’s recent flops affected fan’s love for modern Sonic titles, or is there enough love for both the modern era and a fun romp through the golden age? More importantly, has Sonic Team learned from the mistakes of it’s past? First off, it should be noted that this game doesn’t try to experiment with new game types – it’s a back-to-basics formula of what worked in Sonic Generations and Sonic Colors (the better received 3-D Sonic games since SA2) and building on that. For the first time in a long time, Sega is playing it safe. Do you want me to tell you how modern Sonic plays? He plays EXACTLY like modern Sonic. Do you want to hear how classic Sonic plays? He plays EXACTLY like classic Sonic. If there are any slight differences, I didn’t notice them myself. The new game mode is played with the avatar, a character you create and referred to as “the rookie” throughout the game. You decide how the character looks and what species he/she is. I believe you buy extra gear for your character through both common gold and red star rings, thus giving a reason for you to replay levels and giving the game a whole “carrot on a stick” feel (although I’m guessing this seeing as how you can no longer regain any rings you lose). This makes some boss battles more challenging as me and Alex watched one poor soul who just couldn’t seem to beat Eggman during the classic Sonic boss fight. During our play through of the demo, our avatar was generated completely at random; sometimes I’d get a purple cat, other times a black bunny, and there are videos on youtube of some playing as the red wolf from the trailer. Before you enter the level, you’re given the choice between two different “Wispons”, a wisp-powered weapon. 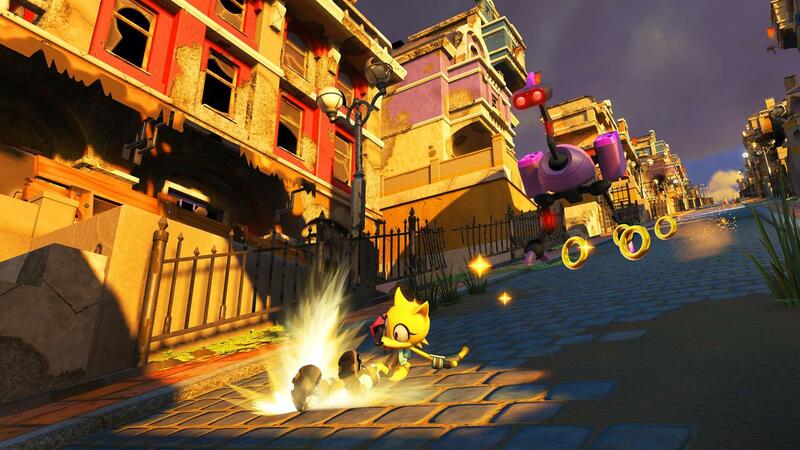 A flamethrower Wispon allows you to use the burst wisps to project your character higher into the air, while the other weapon, a lightning whip, allows the player to execute the light speed dash and quickly follow a trail of rings. There were two different stages in the demo depending on the system: the Nintendo Switch got a level very similar to modern Sonic’s stage, in which you eventually travel a slightly different path, and I found this level to be the most fun level in the demo. He/she can use their grappling hook to swing up to higher paths or attack robots via a homing attack. Alternatively, you can also use your Wispon to bring down a whole group of robots all at once. The Switch level was fast, visceral and overall, fun. This was mainly due to going through the levels a breakneck speeds only stopping to attack your enemies, with no real emphasis on platforming. …And that’s where the PS4 level comes in to play. Oh boy. The level sees the player racing down the Green Hill zone as it appears to be undergoing industrialization, while being chased down by a giant robot crab while smaller robot crabs try to squash you along the way. This level is entire 2-D and requires precise platforming to get through – if you read Alex’s take on the avatar character, you’ll have some appreciation for why this is a bad thing. The physics while jumping with the avatar doesn’t feel right, and it is almost impossible to turn in mid air; small platforms throughout the stage make playing the level a bit of a chore rather than fun. However if this issue can be remedied for release, then the Avatar mode could be the best new gimmick yet avatar controls much like Sonic. Personally, I don’t want to fish, I don’t want to brawl, I don’t want to pilot a mech. I want my extra character to control like Sonic as I think that is what works best in a Sonic title! It seems that Sonic Team are really investing in the avatar stages, embellished with vocal songs that are only present in their stages. These stages have the potential to be the best stages on the Switch version of the game, and if they can nail the physics, this is looking like it could be a top-tier 3-D Sonic game. I managed to play the demo on all 3 systems, and one thing I noticed was that PS4 version of the demon was playing on the PS4 Pro…and it showed. The 1080P graphics looked incredible, and were of similar caliber to Sonic Generations on the PC with ultra-high settings. The XBox One version looked to have been running at 720P as it seemed lower resolution; this might be due to anti-aliasing and as Alex mentioned in his article. The Switch version, while still very detailed, appeared to suffer the most graphically and seemed to be at 720 or sub-720P with jagged edges due to no anti-aliasing. 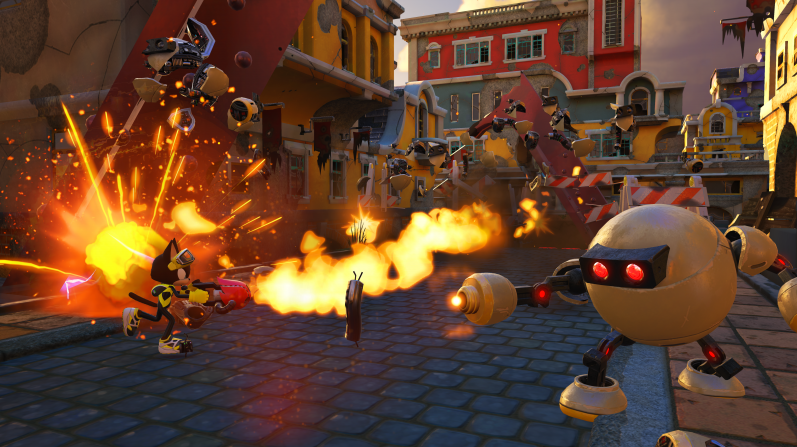 Physics aside, Sonic Forces is looking to be a solid, above average Sonic title. I think Sonic Team have made the right choice to stick to proven game styles, with the new gimmick being pretty much “Sonic with weapons”. I doubt it will beat Sonic Mania in reviews or sales, but still, it appears we are getting two great Sonic games in one year. Join Alex, Sven and myself as we discuss Sonic Forces. Is it a hit or a miss and what do we think of the new Avatar gameplay? Are we actually getting TWO great Sonic games this year? Tune in!